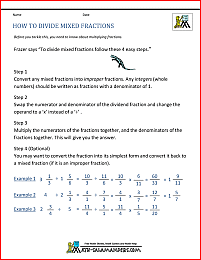 Welcome to the Math Salamanders 5th Grade Adding Subtracting Fractions Worksheets. Here you will find a wide range of free printable Fifth Grade Fraction Worksheets which will help your child to learn to add and subtract fractions with unlike denominators. Here you will find support pages about how to add and subtract fractions. Otherwise, for more detailed support, keep reading! This video clip shows you how to add and subtract fractions. 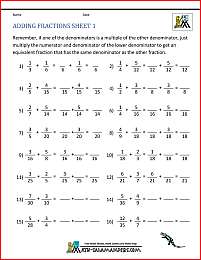 There are several different examples including adding and subtracting fractions with both like and unlike denominators, and also examples where one denominator is a multiple of the other. 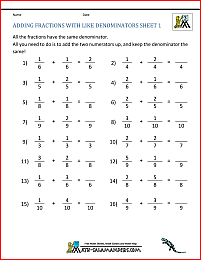 Here you will find a selection of Fraction worksheets designed to help your child understand how to add and subtract 2 fractions. The sheets are carefully graded so that the easiest sheets come first, and the most difficult sheet is the last one. I suggest that you start with adding fractions sheet 1, then go to subtracting fractions sheet 1, then adding sheet 2, subtracting sheet 2, etc. 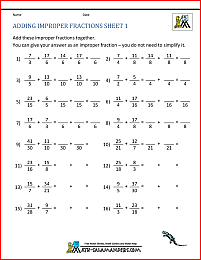 Once you have mastered these, try the adding and subtracting sheets section. 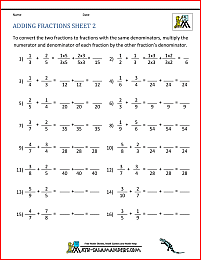 If you are looking to add fractions which have the same denominator, then we have plenty of sheets for you. The sheets in this section will help you learn to add improper fractions. 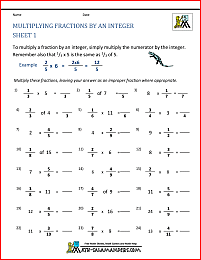 Some of the sheets also involve simplifying the fractions and converting the answers to mixed fractions. Here you will find a selection of Fraction worksheets designed to help your child understand how to work out equivalent fractions. This is a pre-requisite for knowing how to add and subtract fractions. find a fraction that is equivalent to another. 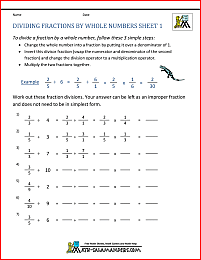 All the free Equivalent Fractions worksheets in this section support the Elementary Math Benchmarks for 4th Grade.